Scientist study revealed that the new bird flu virus could be harder to trace, because it can spread to any poultry farm without indicating any signs, according to report by Yahoo News site. Scientists around the world urged Chinese veterinary to conduct widely animals and birds examination in all affected regions to detect and eliminate this new bird flu virus before it becomes widespread. 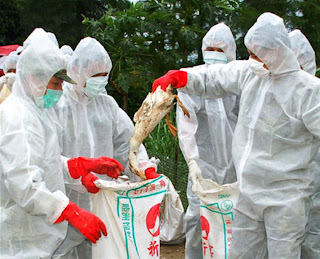 The H7N9 virus (new bird virus) is troubling because it can infect poultry without producing any symptoms, while seriously sickening humans, according to scientists. Over the last weekend, China have reported 2 deaths in Shanghai in the strain's first known infections of humans. Then on Wednesday, a 38-year-old cook working in Jiangsu province got infected by the said virus. According to Scientists that they closely monitor bird flu viruses, fearing they may change and become easier to spread among humans, possibly sparking a pandemic. For the meantime, If you like this news, please bookmark it now or visit this site more often for you to be updated. You may also share this post to your friends so they may know about the New Bird Flu Virus. Comments or suggestions about "New Bird Flu Virus could be harder to trace" is important to us, you may share it by using the comment box below.